Sweet Georgia P’s at Amee Farm in Pittsfield is a work of art. I was invited for a tour last week and inspiration wasn’t hard to find. 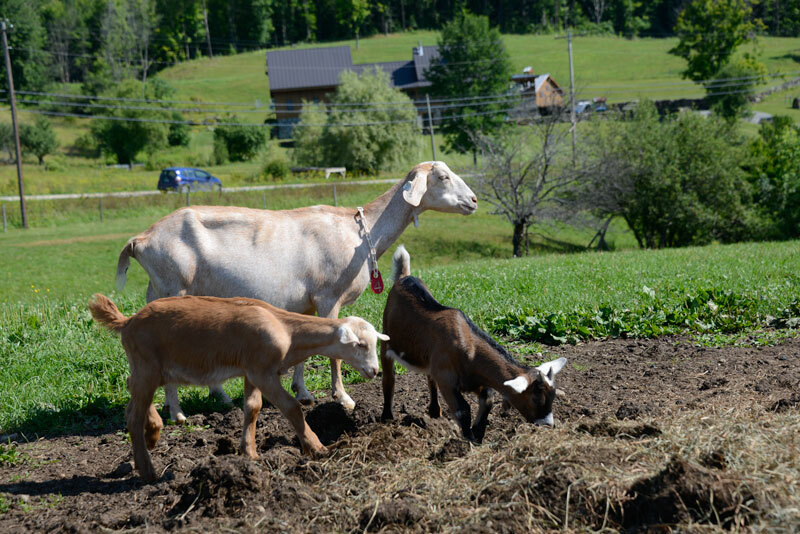 We wandered past tidy organic gardens and into the upper pasture where we were introduced to some new friends. Including 35 goats and 250 chickens. Vermont at its authentic best. 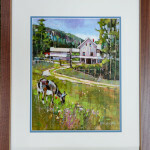 This beautiful farm and one of the residents made for a great subject to paint at the Killington Art Garage demonstration. 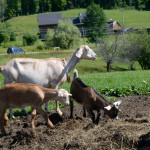 This will be the last “A Day in Vermont” newsletter until Sept. There are four seasons in Vermont… Fall, Winter, Mud, and Construction. I’ve decided to take August “off” to focus on a substantial project here at home. We are moving my studio and frame shop from the basement where I have been for many years, to the larger (former gallery) space above the garage. Thanks in advance for your patience and understanding. I’ll be back to painting soon in the new studio and I hope you can come out for a look and visit once it’s done. Here’s a shot of the “before”… a blank canvas waiting for a creative outburst of construction activity. I’ll draw two free print winners from our list of Day in Vermont subscribers in Sept to make up for August. Sat & Sun Aug 8 & 9 – Art in the Park, Rutland VT – I’ll be in my usual hiding spot on the north side under the maple tree. Praying for good weather. Hope to see you there! Fri & Sat August 14 & 15 – I’ll be painting in the historic village of Waitsfield at the Great Vermont Plein Air Paint Out on Friday. The paint out event runs through Saturday and culminates with a show and sidewalk sale of art Saturday afternoon. This event is just one of many during the Vermont Festival of the Arts in the Mad River Valley. While I won’t be sending any A Day in Vermont email newsletters in August, I’ll do my best to post these and any other announcements on my Facebook Page in a timely manner. Have a great August and I’ll be seeing you back on A Day in Vermont soon. This painting is exquisite!! We shall miss Mondays with you but are going to try for the events in August. Please bring note cards to Art in the Park! I need them. Exciting news for your home project and we will have to come see it. Happy August with exciting days ahead! I’ll see you at Art in the Park Muriel, please let me know what cards you would like as I typically only print those on demand. Thanks so much for all of your support this year! Lovely and peaceful picture. Sounds like you have a great project ahead of you! Lot’s of sanding David. But it will be worth it in the end. Thanks! Just enjoy watching you paint. Looking fw to see how your ‘new’ studio turns out. Happy construction. Thank you Mechthilde, I really love to build stuff so it will be a fun project. Thanks for the shout out! We’ll see you on August 14th! You bet Karen, looking forward to seeing you guys soon! Peter, always hard to use the word “favorite,” since I’ve favored so many of your works over the weeks and months of your postings! 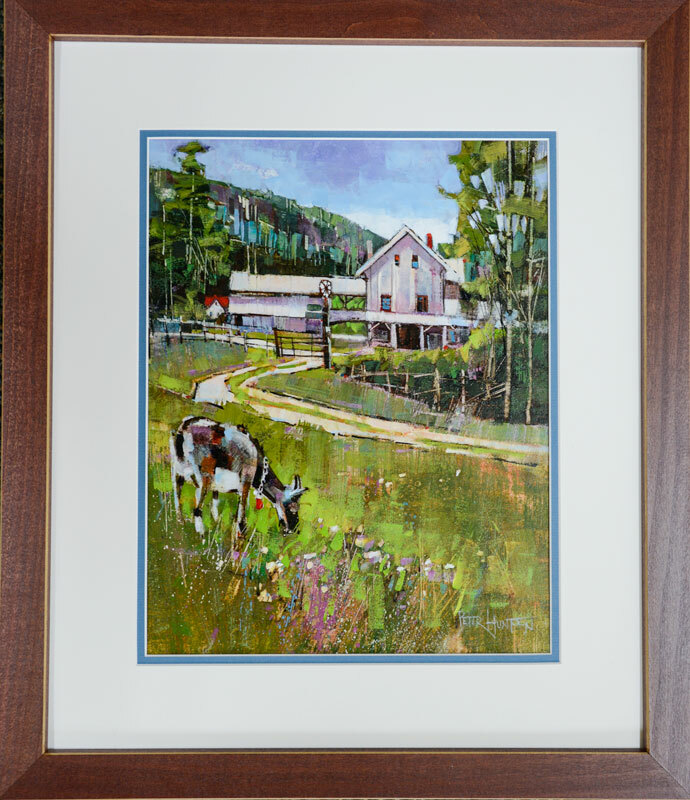 But your choice of a vertical format, the way the eyes is drawn from sky to trees and high pasture to farmhouse and, ultimately, to the belled goat captures the essence of this scene–and, of course, the essence of Vermont. 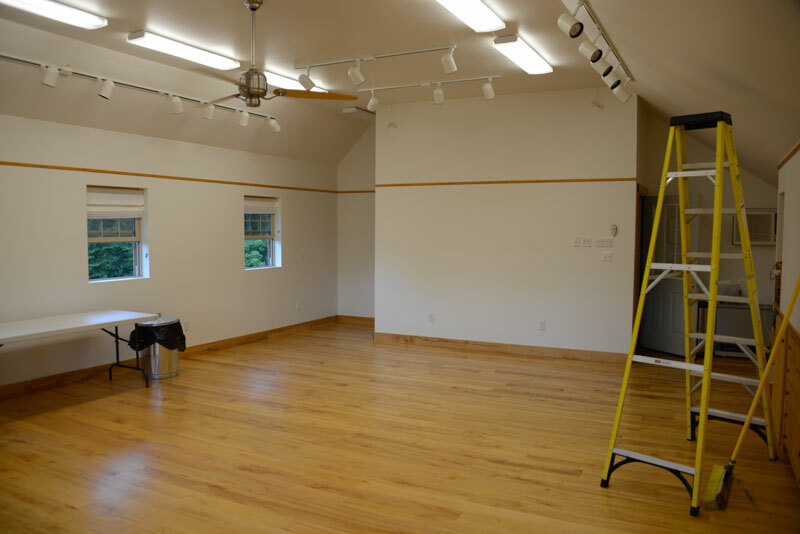 Thanks for the “before” shot of your new studio…we look forward to seeing the finished work and to your visual gifts each Monday morning! Thanks very much Linda! Each painting is different and can be appreciated individually, kind of like people I suppose. You will have to visit the new studio in Sept.
any way to get a schedule for classes in Sept and Oct ? I don’t have any official classes scheduled this year Deb. Sorry about that. I may do an “On the Spot” day in Sept or Oct, and will announce that here on A Day in Vermont when I have a date. Thanks! 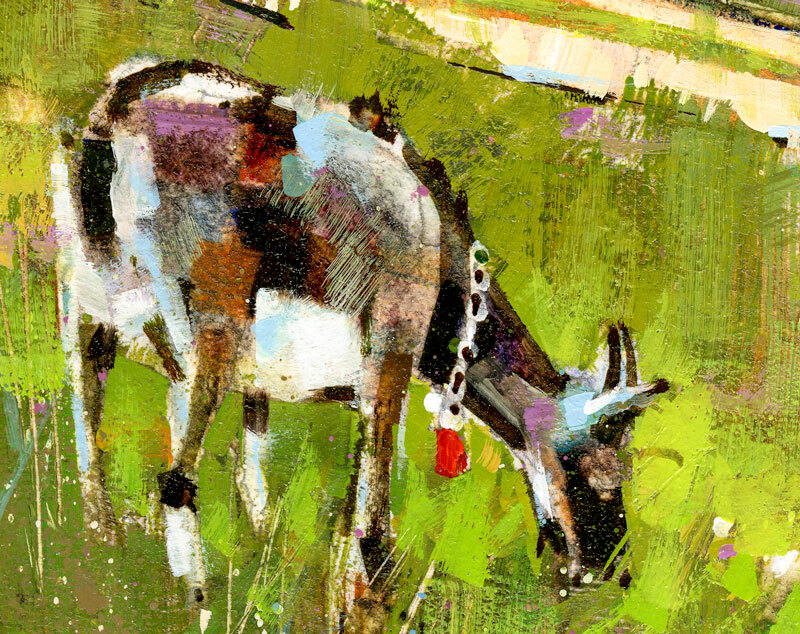 Only a true artist could choose those colors and create a goat that looks so real! Superb control of color values resulted in a wonderful painting. Thanks Brian, sometimes the colors seem to choose themselves. But I guess that’s only because I’ve been painting for so long. I don’t mind turning some decisions over to auto pilot, as long as it doesn’t crash the plane. Gotta make hay while the sun shines. Thanks Cynthia! Always a pleasure to watch you at work! Thanks. Mondays won’t be the same but enjoy your well deserved month off. I’ll be watching for September. Thanks, and keep cool Brian! I really enjoy your style of artwork. Great painting, every time i see your work i want to visit Vermont. Loved all the colors in the goat. Thanks John, hope you can visit Vermont soon! Thanks for the tips you gave me at the Waitsfield paint-out regarding the aquaboard. I’m certainly going to try it! I just saw the video, I wish I had been there! Your colors are very special, beautiful! Good luck with your new project! Tamara from Guadalajara, Mexico. Thank you again. Thanks very much Tamara, it was great to meet you guys. Happy painting! i love your work, and your involvement in the local community is very inspiring. (I used to teach at Poultney, and most of the kids had seen you one way or another in a master class or workshop or demo. That is awesome). I have yet to purchase a print, mostly because I can never choose. Something about this one really jumped out at me. 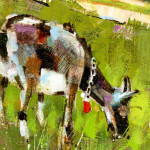 As silly as it sounds… I credit the red in the bell on the goat. 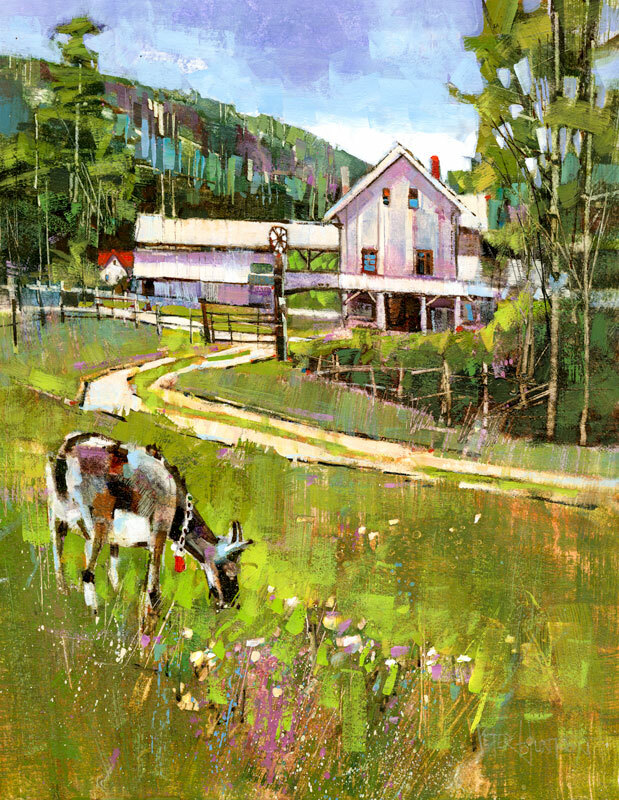 The colors in this piece are great… A vibrant, magical Vermont summer. The echoing of the red in the rooftops on that little bell… Somehow makes my eyes dance around this painting. Love it! Thanks so much for the nice comment Jen, much appreciated. I too often equate painting and dancing. (no, I can’t dance!) Just let me know if I can help with a print. Thanks again!